An unexpected visit from Don Rickerby, President of the Royal Horticultural Society of Victoria, Jennifer Rickerby, Secretary of RHSV and Paul Crowe former Principal of the State Schools Nursery, patron of the Kevin Heinz Foundation and active in the Nurseryman’s Association, surprised Kevin and upset the agenda planned for the evening. 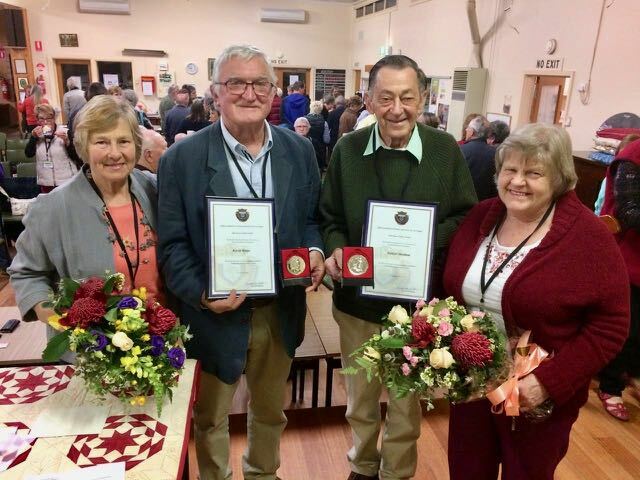 This visit was for the presentations of the John Pascoe Fawkner Award to Bob Shelden and Kevin Hince for their outstanding service to horticulture, community activities and their service to the Upper Yarra Valley Garden Club over many years. These awards have been almost a year in the planning and have been organised with the utmost secrecy much to the surprise of the recipients. Thanks to Shirley, Jenny, Joy, Janet and Ros. This entry was posted in Announcements, Guest Speakers, Reports of Meetings and tagged Bob Shelden, John Pascoe Fawkner Award, Kevin Hince by Colin Spain. Bookmark the permalink.